Dr. Richard Boylan mentions a race called the Altimarians. Altimar would be a planet that circles a red dwarf sun that would belong to the same system as Barnard's star. At present, no such red dwarf has yet been discovered, nor does anybody else mention Altimar. 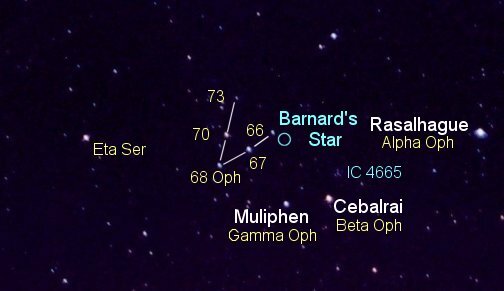 (Though Barnard's Star itself is a red dwarf). Boylan claims that a team of hybrid Altimarians would have come to earth. Allegedly, their mission is to work on remedying the environmental damage which has occurred in so many of our ecosystems. They also look forward to eventually working with select top Human environmental scientists in a collaborative effort towards environmental clean-up and restoration of Earth. They will teach our scientists, and show them the advanced technology which they useto help clean up Earth faster than we can do it on our own without such advanced environmental knowledge and equipment. These people would be hybrids, i.e. Altimarians with added human DNA so that they could better adapt to Earth. As I said before, nobody else mentions them.